We are featuring the Here's to You Promotion. If you have come here from Kirsten Desorcy's Blog, you are on the right path! The blog hop is a great big circle, so you can start here and work your way all around. If you get lost along the way, you’ll find the complete list of participating consultants on Melinda’s Blog. This month we have approximately 15 Close To My Heart Consultants sharing their creations using this stamps, cardstock and other fabulous CTMH products on their blogs. This is simple to do - just click on the link at the end of the post on each blog to move to the next one! Here we go! 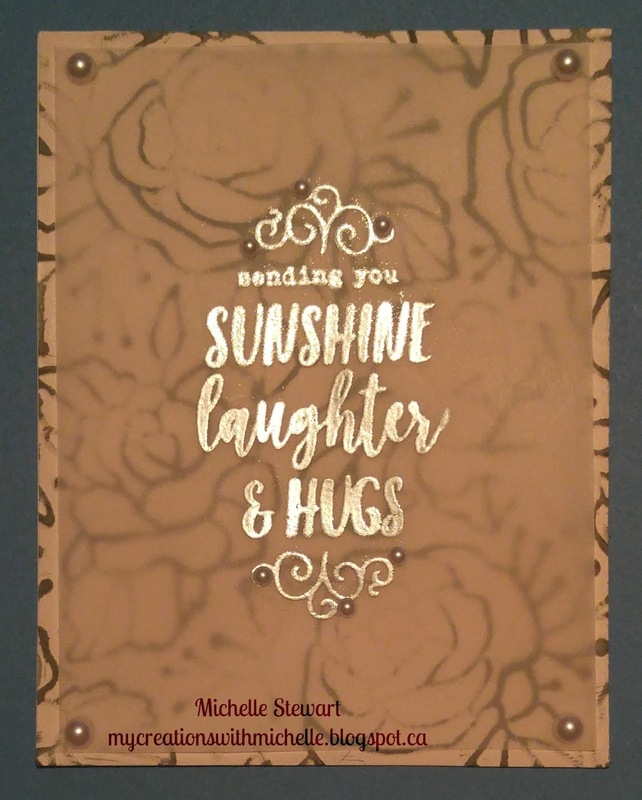 For my card, I started with a base Pacifica CS base, I then choose the darker side of the Bashful cardstock and used the Rose Embossing folder to give it the pattern. I then inked the raised image using Pewter ink. The sentiment in stamped on the vellum and heat embossed with Silver Embossing Powder. I used the White Pearl gems at the corners where I placed some glue dots to secure the vellum to the Bashful cardstock. I also added some smaller pearls to the swirls in the embossed image. Use the materials in this kit to create one scrapbook page and seven cards. Now "Hop" on over to Wendy Kessler's blog to see her work! Be sure to visit all the Consultants at their Blogs to get some great crafting ideas and other fun ideas! Remember, this promotion, Here's to You is only available until August 31st! Contact your CTMH Consultant (or click here) to see how you can get this promotion! Beautiful! It makes me think of suede or leather. Very nice! Sweet card! Love the layers, and the inking the raised embossed image. Reminds me of leather as well - the embossing turned out very clearly. Love how you embossed,inked and used the velum - such s cool effect!